Well, this beauty speaks for itself, no? It's an extra-long tunic/dress! 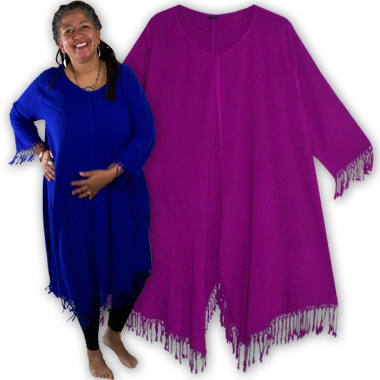 Amazing over pants or leggings or all on its own, this long and fringy piece fits zaftig and willowy goddesses, tall or petite -- it's almost an entirely different garment on every different figure! It features a soft rounded neckline and showers of fringe on the 3/4 sleeves, along the hem and up the deep slits front and back -- the ultimate WOW!